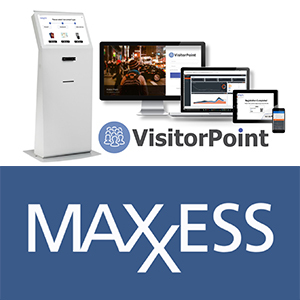 VisitorPoint from Maxxess is a smart visitor management solution that offers an easy but powerful upgrade for a wide range of users. For those needing to replace a basic signing-in book for the first time VisitorPoint is an attractive, user-friendly solution with a choice of useful features. And for larger organisations looking for a multi-site visitor management solution, it provides control and audit features that are future proof, flexible, and designed to complement security, fire and building management operations. It can be integrated with Maxxess software and eFusion range of modules, or adapted with a customised integration, plus it allows users to manage everything from visitor pre-registration, to SMS notification, identity verification and car park occupancy. Putting more control in the hands of front-of-house teams, VisitorPoint allows pre-registered visitors to be viewed any time in advance. Visitor badges can be pre-printed for a smoother and more efficient welcome, and sign-in for large groups can be managed in seconds. The allocation and control of visitor car parking also becomes much more efficient as specific spaces can be easily assigned to specific vehicles in advance. Automatic email notifications and/or SMS messaging reduce the burden on front-of-house staff, with employees automatically alerted when their visitors arrive. The system can be set up so that both hosts and visitors receive a friendly reminder text ahead of the visit, at check in and at check out. Useful information such as directions and meeting details can be added. Hosts can also check out a visitor, helping front-of-house staff to maintain up-to-date site occupancy records. For enhanced security, alerts can be sent when a visitor forgets to check out, or when a pre-specified visit is due. For senior security managers real time reports can be generated to show who is currently on site, where they are authorised to visit, as well as who been on site during any given timeframe. The smart VisitorPoint badge printer allows individual badge customisation so that details can be easily changed and added – for example with wi-fi codes, meeting room details and specific courtesy messages. This feature also makes it ideal for multiple tenancy sites, with individual badge branding and messaging available to each tenant. To learn more about Maxxess solutions in action please email sales@maxxess-systems.com. Maxxess is a U.S.-based, privately held, global corporation specialising in security management solutions and innovative technologies that are effectively transforming the way businesses approach and implement security. Leading organisations worldwide, from healthcare to hospitality and transport to telecoms, choose Maxxess for its expertise in access control and database integration. The company is committed to advancing open architecture security management software, development of leading-edge technologies, first-class customer care plus fair, transparent pricing structures. Maxxess’ systems are in use in more than 10,000 installations worldwide with clients including Emirates Airlines, Banner Healthcare, Fluor Corporation, Open University, Loyola University, Kingdom of Saudi Arabia and CAE as well as an additional 300 schools and universities and more than 100 hospital and healthcare facilities. Established in 2003, Maxxess has dedicated sales and technical teams in the Middle East, Europe and North America. For more information, go to www.maxxess-systems.com.